It's not easy to take care living wall, I think. Thanks for sharing the photos! I completely agree, I think a lot of people underestimate the care required for such an expansive vertical space. I can't believe the wall at Paradise Park has turned into such an eyesore. I haven't visited myself, but it has had a lot of publicity and was suggested to me as a good wall for a case study when there was all the Patric Blanc hoo-ha at the beginning of the year.V sad. Hi Noel - Do you have any experience of interior green walls? Am thinking of doing one for an office space in Bristol and can't find a UK supplier of the kits. Have you seen Green Fortune's work on this in the States? I came acros the Vertiss system at Glee this year. The display looked fine but who knows if it would stand the test of time. 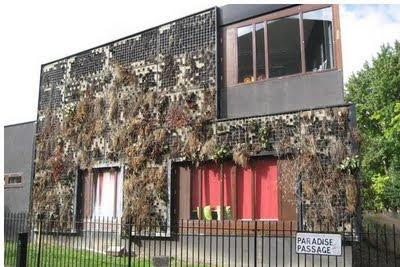 Lets forward to 2013 Noel - now what were you saying about living walls being for elite spaces only?